Foreign Affairs Minister Chrystia Freeland arrives for a meeting with U.S. Trade Representative Robert Lighthizer in Washington on Aug. 30. 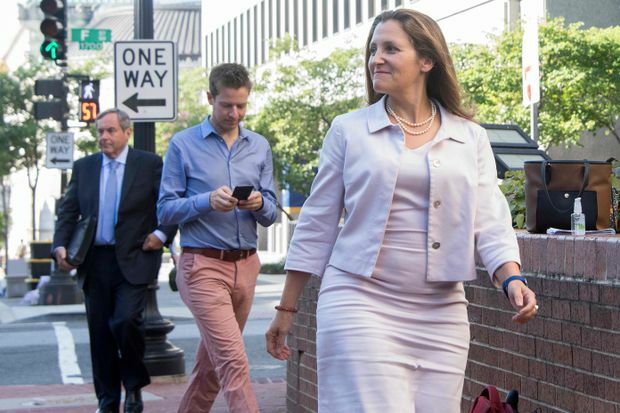 The Mexican NAFTA negotiating team did not throw Foreign Affairs Minister Chrystia Freeland under the bus (Freeland’s So-Called Friends Bid Her Adios – Aug. 30). Weeks, if not months ago, she walked out onto the highway and lay down. Anybody with negotiating experience could see and hear the bus approaching long before its arrival. The disappointing thing is that she and the Trudeau government took all Canadians onto the road with her. Re Give Way, How? (Aug. 30): A letter writer points to the negotiating style of Brian Mulroney and Ronald Reagan during trade talks in order to criticize Prime Minister Justin Trudeau’s approach to NAFTA negotiations. Both Canadian prime ministers were faced with daunting challenges in their attempts to get a fair trade deal with the United States, but Mr. Reagan was a straight shooter while Donald Trump is a loose cannon. Not an even playing field by a long shot. I could not disagree more with the letter writer who chastised Justin Trudeau for not developing a better relationship with Donald Trump. How naive can we be? Mr. Trump has regularly fired the people who work for him, rejects decency in honouring deceased war vets who have served his country, cheated on his wife, divided his people with fear and war-mongering platitudes, supported white supremacists, turned on allies, lied and cheated and done whatever it takes to get a vote. There is no way to have a “relationship” with this self-serving man. We are living in a time where ethics and morals have been cast aside for personal gain. We should be grateful to those who have the guts to call it like it is. It would be impossible to compliment Donald Trump on style, wit or charm, but for a second, consider how he looks to his voters. He has divided and conquered his opponents, in this case Canada and Mexico, and is getting what he wants in a trade deal. A professor in the Department Of Food at Guelph University says the lack of competition means Canada’s dairy farms are inefficient (A U.S. Win On Dairy Trade Stands To Lower Prices – Report on Business, Aug. 30). Recombinant bovine growth hormone (rBGH), used by U.S. dairy farmers to boost milk production, has been connected to increased mastitis in cows. How does rBGH affect us? Some studies say there is a relationship between prostate, breast and colorectal cancers, some say the data is inconclusive. This is what food security is about. As for price, butter is often on sale here for $3 a pound, far less than the $4.50 average in the U.S. Milk costs 55 cents more for four litres – and comes without rBGH. That’s a price I am happy to pay. Enough with the propaganda from the diary cartel shills already. Day after day, we hear hormone-laden milk products would be entering the country without our brave dairy producers. How about government regulation? It works on everything else. While the dairy syndicate receives no money directly from taxpayers, it does pistol whip us at the cash register. Strangely, it’s taking Donald Trump to blow up this rigged game as our politicians are too gutless to do it. Kevin Byrne, Bright’s Grove, Ont. Your editorial is in good company, as far as following the trope that the late senator “steadfastly” put country ahead of self-interest. Potentially the most consequential decision of his long political career, the choice of the appallingly ignorant and untested Sarah Palin to be the proverbial “heartbeat away from the presidency,” is all the evidence needed that when push came to shove, John McCain put John McCain first. Re Falling Ontario Test Scores Add To National Math Debate (Aug. 30): Ontario wants a return to basic math instruction, but the province’s students are probably already getting more rote learning than the Education Ministry realizes. My own family’s experience with discovery math (albeit in Newfoundland) is that students are afforded precious few chances to use creative problem-solving skills. Instead, they are forced to solve each simple problem three or four different specific ways, forced to use pictures, words, number lines, cutout shapes and sometimes even numbers in a redundant exercise guaranteed to magnify boredom and frustration. Discovery math seems to be just the old rote learning but with a heavy dose of confusion added as students attempt to figure out the many ways to add 2+2, but never really master any of them. Re Ontario Judge Restores Defence Of Extreme Intoxication In Sexual Assaults (Aug. 29): I’m not a lawyer. So maybe I’m missing something. We’re told that an Ontario court, reinstating the intoxication defence for sexual assault in this province, says sexual assault is not morally equivalent to being extremely drunk. Criminal lawyer Jennifer Trehearne in the same article says “choosing to get drunk is not as bad as choosing to commit a sexual assault.” Well, no, I wouldn’t think it was; I just don’t follow the logic beyond that point. If I’ve got this right, get so drunk you don’t know what you’re doing and sexually assault someone, then you have a defence. Get so drunk you don’t know what you’re doing and try to drive home, I’m guessing you don’t. So is sexual assault “not as bad” as drunk driving? Or is the thinking that digging out your car keys, getting behind the wheel, turning on the engine and putting the car in gear doesn’t require intent? Or what? Re Land Rover At 70: Leading The SUV Pack (Aug. 24): This brilliant piece stirred memories of 1990, the year I drove a 10-year-old, Series III Land Rover across Africa with two other Canadians. We were straight out of university, and purchased our Land Rover in Aberdeen, Scotland, for $3,000. Our truck was bright blue – having formerly belonged to Scottish Hydro – and we nicknamed it “Blue Jay.” Over 10 months we travelled 26,000 kilometres, through 19 countries, proudly displaying the Maple Leaf (including crossing the Sahara). At the end, we sold Blue Jay to the Zimbabwe Department of Parks and Wildlife. For all I know, it’s still going strong today.